Sadly, there is a dearth of good fantasy movies out there. I don’t know why this is. There are tons of great fantasy stories, but translating them to the screen seems to get the best of a lot of movie directors/producers. A few of them do it well, and thankfully fantasy has begun to rise in the ranks of popularity as a movie-genre, but still there just aren’t a ton of great fantasy movies out there. Maybe it’s because dragons are overwhelmingly difficult to get “correct.” Or perhaps it’s just that when it comes to visuals, the budget gets spent on special effects and nothing is left over to pay the actors… I don’t know what it is. Let me be clear. There are actually quite a few Fantasy Movies in existence. It’s finding good ones that can be difficult. Fantasy movies have a tendency to come out either a touch ridiculous, or super cheesy, or really not at all family-friendly. So today, I wanted to highlight some of my favorite lesser-known fantasy films. I’m sure you can’t possibly have missed the big blockbusters of recent days such as The Hobbit Trilogy and The Lord of the Rings… or the Harry Potter Saga… or the overwhelming mass of superhero movies both from the studios of Marvel and DC (Aquaman was AWESOME by the way). So I’m not going to cover those. I’m going to talk about ten of my favorite lesser-well-known fantasy favorite movies. So, I started my list with 24 titles… but I didn’t want to write the monolithic post that would require. So… I took off any movies I’ve talked about or reviewed on the blog before, like The Neverending Story (which I haven’t done a whole post on, but have definitely mentioned several times), Stardust, Reign of Fire, Ella Enchanted, The Princess Bride, Bridge to Terabithia, and Ladyhawke - which are by far my FAVORITE fantasy films, and that’s why they aren’t in this post. In case you were wondering. Or worried. Then I knocked off a few that I didn’t think really fit the “fantasy” criteria as well as others, Cowboys and Aliens is super fun, but definitely more sci-fi than fantasy, Tall Tale, Into the West, The Lake House, Heaven Can Wait, Phenomenon, and The Secret Life of Walter Mitty all came off the list because they all kind of fall into a nebulous category of having fantastical elements, but not necessarily being “fantasy” movies. And that leaves me with 10 Lesser-Well-Known Fantasy Movies that I enjoyed and I think you might, too. Starring Sarah Michelle Gellar in what I think is her best role, this enchanting little rom-com is fun and fantastical and maaaaybe a little weird. If you like stories like You’ve Got Mail, I.Q. and Leap Year but your one complaint is that there is no MAGIC in those movies… then this one is for you. Amanda is a truly terrible chef. She can’t cook at all. Which is a problem, because she’s inherited her mom’s restaurant, and if something doesn’t change soon, she’s going to lose her business. But when her sous-chef brings home a magical crab from the outdoor food market… Amanda suddenly gets an inexplicable talent-boost. What’s more, her food begins to affect the people who eat it with whatever emotions she was feeling at the time she cooked it. This one barely makes the list because the ridiculous factor is almost off the charts… but it’s cute and fun. There is one moment of crude humor that I remember. When I saw the trailers for this one, I thought it was just going to be a rehash of Fern Gully smacking us all over the head with the “humans are evil” agenda. However, I was pleasantly surprised! While there ARE tiny people living in the forest – called “Leafmen,” their greatest enemy isn’t humans… it is wicked creatures called Boggans, whose job is to control rot and decay in the forest. However, the Boggans are not content with the areas of authority they have, and they are constantly seeking to take over. During a Boggan attack when the Leafmen are at their most vulnerable, a young woman (whose father has been obsessively searching for these tiny people and subsequently got laughed out of various serious scientific communities) gets magically miniaturized and drafted into the struggle between growth and decay, life and death. Additionally, this is a very sweet story of the restoration of the relationship between the main character and her father. I’m always amazed at how few people even know this movie exists. Enter the legendary world of King Arthur, complete with mythical creatures and the magical blade Excaliber. When Sir Rupert, one of King Arthur’s knights, turns against him and attacks, a young girl named Kayley loses her father who leaps to defend the king. Fast-forward approximately 10 years and Kayley has grown up a bit, but she’s still dreaming of adventure like the kind her father told her about in stories. Meanwhile, Sir Rupert has not gone away forever. He’s been plotting his next scheme to take Arthur’s throne – but his attempt to steal Excaliber is foiled. When he takes her mother hostage as part of his plan, it is up to Kayley to retrieve Excaliber from where it got lost in the forest and return it to its rightful owner. A beautiful story with awesome characters and absolutely gorgeous music, this one rivals most of the Disney Princess movies, in my humble opinion! This movie is so beautiful. Just from a visual perspective, the artistry of the animation is breath-taking. The story and characters are quite compelling as well. 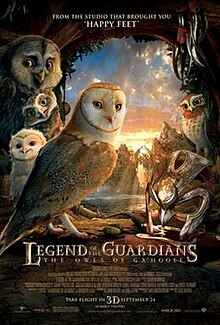 A young owl gets taken prisoner and sees his friends and brother get brainwashed by the Pure Ones (a sect of owls that is trying to create an army to take over the kingdom the MC is from). He makes a daring escape and must team up with some unlikely companions in order to save everything he loves. Okay, this one isn’t really “less” well known, but it had to make the list. 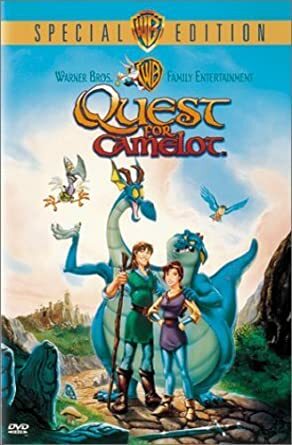 One of my all-time favorite dragon movies, and if you haven’t seen the cartoon spin-off “Dragons: Race to the Edge,” you’re seriously missing out. (It’s available on Netflix) My kids LOVE it, and I really enjoy it as well. Very good cartoon series. I fell in love with this movie immediately after seeing it for the first time. The idea of the myths and legends we grow up with as kids (Santa Claus, the Easter Bunny, the Tooth Fairy, Sandman…) being the “guardians” of childhood is both compelling and beautiful. If you haven’t seen this one, I highly recommend it. This really was an underrated film. 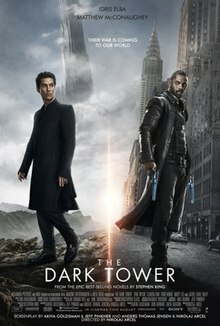 For being based on a video game, it actually turned out to be a super fun romp of a movie. An adopted prince. A conspiracy to steal the crown. A magical dagger that can turn back time. A young man accused of a crime he did not commit… this movie has all the elements needed for an epic fantasy experience, and what’s more, I would argue that it delivers what it promises. Fun. Action. Magic. And Jake Gyllenhal at his best. Okay, so this one isn’t so “less” well known either. 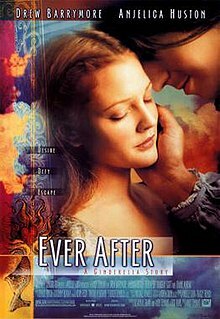 But in my opinion it is still the best live-action fairy-tale retelling movie out there. I have grown to love the 2015 Cinderella movie… but it still doesn’t even come close to the magical feel, romance, and “edge-of-my-seat” type thrill that Ever After brings to me every time I watch it. I just love this movie and can watch it over and over. Despite the fact that it is devoid of most “fantasy” elements, it makes the list by being a Fairy Tale Retelling, and an epic one at that. Topping my chart today… (honestly, I couldn’t quite decide between this and Prince of Persia… but Nicholas Cage + Jay Baruchel work together to beat out Jake Gyllenhal by a TEENY TINY margin. Partially because it’s fun seeing what “Hiccup” really looks like — *grin* — but also because Nick Cage… in quite possibly his best role ever… as a wizard. Merlin’s Apprentice, to be precise. But now he must take on an apprentice of his own and teach him quickly how to master the magical arts in order to save Manhattan from a powerful enemy. This movie is really fun. So much humor, so much crazy, so much ridiculous… and yet… it actually works and is a pretty epic movie. And that’s what I love about it. So there you have it. A list of awesome fantasy movies you can watch with the family. What are some of your favorite fantasy movies? Any I neglected to list here? Wait, Prince of Persia has time-magic in it? WHAT? I need to watch this movie NOW. Yes! And I think that for time-magic, it actually does it pretty well. Time travel and time-magic can be difficult to pull off without leaving a bunch of obvious loopholes, but I enjoyed this one. Good to know! Time magic is simultaneously my favorite thing and the thing that makes me nervous whenever I read something that involves it — less because of the obvious loopholes things and more because there’s a particular time travel storyline that EVERYONE seems to do and can very easily result in a lot of secondhand embarrassment for me. Prince of Persia is SO MUCH FUN, Sarah! I love it! Good to know! I know I’ve heard you talk about it on your blogs a couple times. Would you say you love it for basically the same reasons Jenelle gave, or are there other elements you really like, or . . .? I love the humor and the banter and the timey-wimey-ness which was so coool and brilliant, and I really loved the characters — the prince and the princess are the best sort of fight-each-other-but-I-ship-them sort of pair and he also has some fascinating brothers and it’s just so FUN. I love how fun it is. Sounds awesome! I will definitely have to watch it sometime; maybe I can get my roomie in on it too. HTTYD! Prince of Persia! Two of my top favorite movies. Sorcerer’s Apprentice was so much fun. XD (These are old man shoes! Excuse me? I… love them. Knuckle-bump? May as well. XD) And I loved Rise of the Guardians! Ever After was fun too. I enjoyed Epic as much as I saw of it but the library copy I watched was scratched so I kept missing bits and only have a vague idea of what happened at the end. -_- Same thing happened with Up which was even worse. But I loved the mentor character–Ronan, was it? AND I NEED A HUMMINGBIRD TO RIDE!